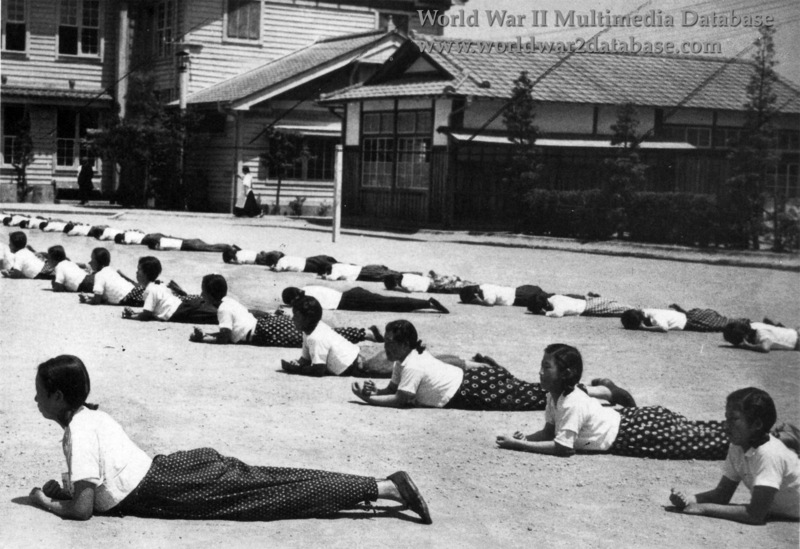 Female students of Uziyama Tadaka School practice taking cover from air attack. From late 1944 until the end of the war, middle and high school students were released from classes and assigned to war work. Older students worked in munitions factories and younger students cleared firebreaks in cities. If they were caught in the open during an attack, as they were at Hiroshima, casualties were heavy. As unskilled labor, the quality of their munitions left much to be desired. Tsu was attacked by the 58th Bomb Wing on the night of July 28, 1945. 57% of the city was burned out.